Chevy launched the new Camaro web site today. Unfortunately, the cost cutting at GM is crippling assets as the team had to recycle videos from the upcoming Transformers film so they would have more than one video in their gallery. The one original video for the launch also suffers from some poor computer graphics (CG) development. Too bad, because the Camaros are showing up on the roads here in Michigan and the car looks amazing. There is also a link called "Global Development" that lets you see where in Japan the body seal testing occurred. What?! Huh? Yes, if you care, you can learn how the car is a global development effort. Seems like an odd thing to share when GM is doing its best to say it is an American car company that needs to be saved. Not that global manufacturing is any secret, it just seems very disconnected to the brand of the Camaro -- a classic American muscle car. I'm just going to assume the inclusion of this content was not strategic, but rather an attempt to get some content added when budget is scarce. The best part of the site is the well executed Compare page. 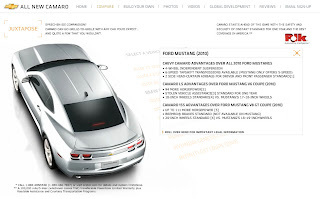 It gives you a list of various direct and indirect competitors and lets you see how the Camaro is a better choice. Of course, it is your typical compare from an OEM website. So, the 0-60 times compare the Camaro against a model with the less powerful engine (eg BMW 328i instead of the twin-turbo 335i.) Comparison cherry-picking aside, it is well executed and also continues Chevy's tradition of adding credibility to the compares by including the Polk Automotive (third-party) logo. The biggest gap in the execution is a lack of sharing. There is no way to share photos, tell a friend, all types of content extension are missing from the site, which is very odd for a passion product like Camaro. Though I did, after looking at the site a third time, notice you can share the videos but it is not very intuitive.